From left, “Sir” Robert Griscavage, Bonifacio Dewasse, Robert Hairston, Ruth Miller, William Miller, Rebekah Miller, Perry Emes, Marylou Martz and Joan Decker celebrate 20 years of participating in Mini Medical School. In her seat near the front of Junker Auditorium at Penn State College of Medicine, Ruth Miller chuckled. Teams of her younger classmates were using CPR to revive two mannequins simulating cardiac arrest. The exercise was meant to show the importance of teamwork in a crisis. “But how do you learn to think on your feet?” someone asked. Ruth thought of a joke. In her 81 years on the planet, among all the lessons about art, music and medicine she’s collected, Miller knows comic timing. For 20 springs, Ruth has been coming to the College of Medicine Mini Medical School — the program in which faculty and full-time students share their knowledge with the community. She might move a little slower than when she was a 61-year-old freshman, but Ruth is just as engaged as ever and is, by now, an expert class clown. How do you learn to think on your feet? “You stand up a lot,” Ruth said. Including Ruth, nine area residents have been attending the program since it began in 1999, soaking up knowledge from top health care professionals about everything from hair loss to joint replacement to thyroid cancer. Some members of the 20-year club are local high school teachers looking to add to their curricula. Others, like Ruth, have more personal reasons for attending. “I love learning everything,” she said. In the 1960s, while a graduate student in music at the University of Michigan (“I can play every band instrument,” she said, then paused for effect. “Not all at once.”), both her parents’ health suffered steep declines. Miller decided to point her sponge-like brain toward medicine. Eventually she moved back to Hershey to take care of herself and her ailing parents. Somewhere along the way, her casual study of health care tailed off. Then one day 20 years ago, Miller saw an ad for the Mini Medical School. “Oh boy, I’m there!” she thought. Organized every year by the Continuing Education Office, Mini Medical School’s goal was always to help create a more informed pool of patients. Dozens of College of Medicine employees volunteer every year to share the vital role of their local university health center, said Bonnie Bixler, director of continuing education. And while participants might not be ready to perform surgery, the knowledge scratches an itch. For Bonifacio Dewasse, another member of the 20-year club, the school offers a second chance to learn what he never did. Dewasse, who works as a medical lab scientist at Penn State Health Milton S. Hershey Medical Center’s automated testing lab, had at first planned to attend the College of Medicine as a medical student. He took a job as a lab scientist. Now Dewasse’s two sons are grown up, and he just celebrated his 20th year as a Mini Medical student. Each session of Mini Medical School offers lessons on a different topic. 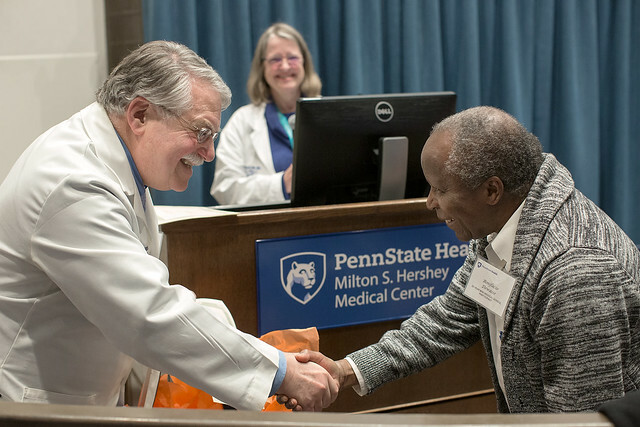 Every year, a panel selects subjects ranging from poison oak rashes to neurosurgery to highlight hot-button issues in health care or the research and clinical work at the College of Medicine and the Milton S. Hershey Medical Center. What volunteers teach doesn’t end inside the walls of Junker Auditorium. Mini Medical School lessons have spread far and wide. William Miller of Linglestown, Pa., taught for 38 years in the Harrisburg School District. Two decades worth of Mini Medical School lessons have found their way into William’s biology and anatomy classes. For example, some of the program’s melanoma slides teach his inner-city students about cancer. And while’s he not ready to practice medicine, William’s diagnoses of his friend’s medical conditions have often been correct. Recently, he told a friend that he’d learned as a Mini Medical Student that a finger ailment he was suffering might actually be caused by something higher on the forearm — the ulnar nerve. He was right. This year’s opening night featured a series of discussions on how microbiomes, communities of microorganisms living in various parts of the human body, play a role in human health. The second night’s session focused on how simulation-based training can enhance patient care. Lisa Sinz, associate dean for clinical simulation, demonstrated why it’s an important tool in medical education. The final evening focused on graduate education and culinary medicine. While Dr. Eileen Hennrikus discussed the chemistry of various metabolic disorders, medical students paired off in a cooking contest of dishes suitable for patients diagnosed with those conditions. Members of the 20-year club were the judges. Program organizers prepared diplomas for all nine of the 20-year students. Ruth accepted hers but has no intention of moving on. At first, she started studying medicine to help her parents. Now, Ruth is often a patient at Hershey Medical Center, and Mini Medical School is teaching her about her own care. She plans to return next spring. Judges, from left, Marylou Martz, Perry Emes, Bonifacio Dewasse, Ruth Miller and Robert Hairston vote on the best tasting biomedical food product during the 20th Annual Mini Medical School at Penn State College of Medicine. Entry filed under: Features. Tags: medical education, Mini Medical School, Penn State College of Medicine.